A choppy day on the beach at South Padre. A walk by the ocean is always interesting----be it the waves, the ships and small boats, the people, or--always--the birds. 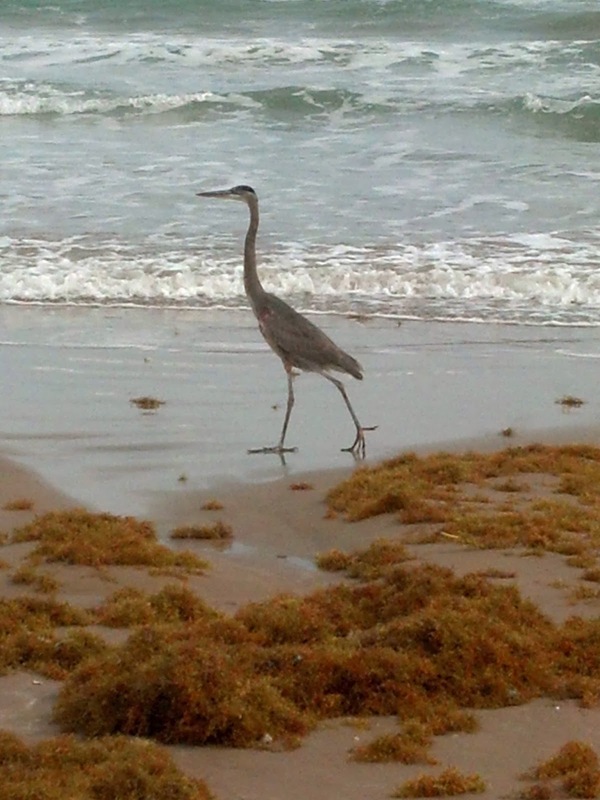 Actually, we were a little surprised to see him right on the Gulf shore. Most herons we have seen tend to like the water slightly away --marshes and pools. This picture was from our phone and had been overlooked last week. So , I could not resist adding it this week. You might recall that we had stopped in Livingston at the beginning of December for quick dental checkups. Well---we somehow never have a quick checkup. Both Jan and I needed a little extra. Even more than a little extra. So here we are on January 6th and hopefully ready to finish the "quick dental checkup". We do like our dentist here and it is a plus that he is set up for everything from cleanings right through dental crowns. While waiting for appointments, we have been able to visit down to Padre Island( see previous postings) and Brazos Bend(also previous). 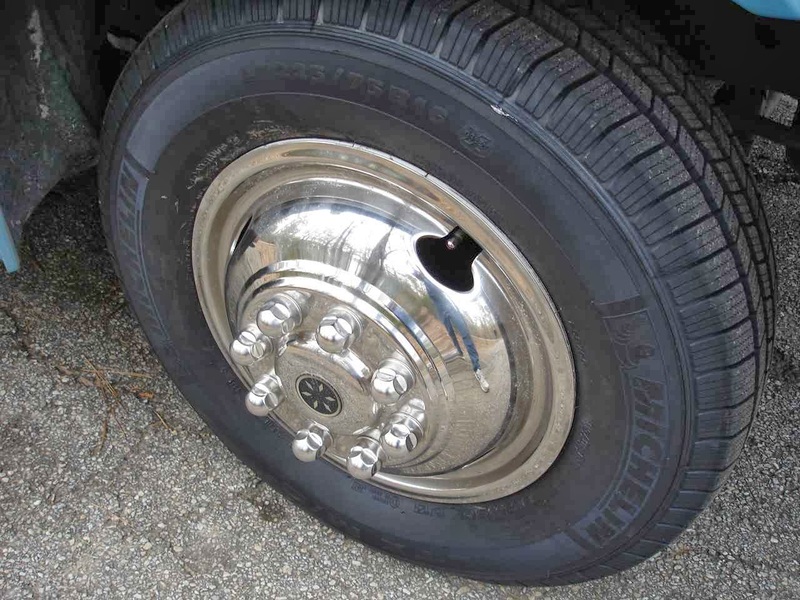 We had an email from John of our Lazy Daze friends telling us of a Michelin tire recall. I checked the Michelin website and called the recall number for light truck tires and saw and heard that the recall was for larger tires than our 225/16's. 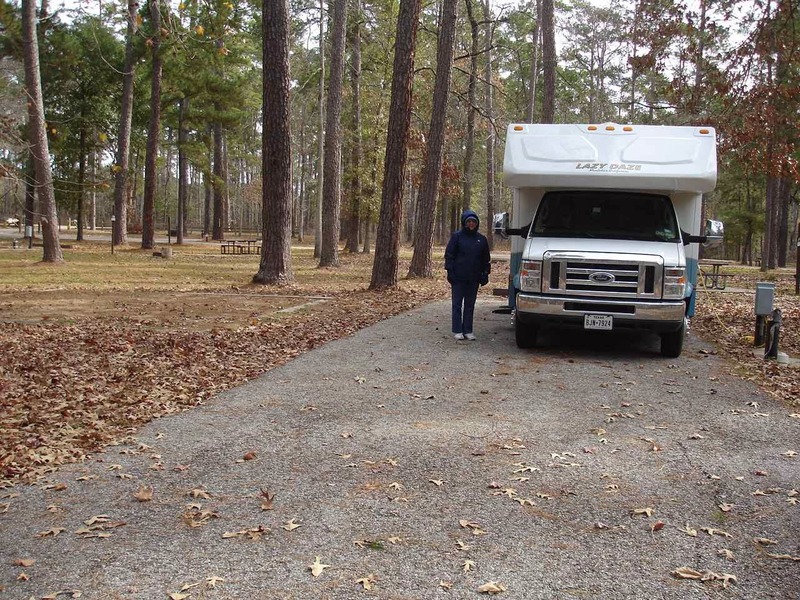 Then a few weeks later I received an email from Escapees RV Club and it specified 225's. WHOA! Back to the Michelin website and this time there is a whole page just for our tires--manufactured in 2012. A quick call to Discount Tire in Conroe, Texas--about 50 miles from Livingston--and we have an appointment for the very next day to replace 7 tires----yep----all 7 which includes the spare--never touched the pavement. So, on Friday, January 3rd, we visit Discount and 2 hours later Lady Blue has 7 new tires--no charge. The old tires had 17,000 miles on them and still looked new, but no one wants to take a chance on blowouts or tire failure. Credit to Michelin, wish all businesses would be as good to back up their products. After our tire appointment, we head north about 20 miles on Route 45 to stay the weekend at Cagle National Forest again. Our site is pictured above the tire picture. Jan is looking cold because it was cold. 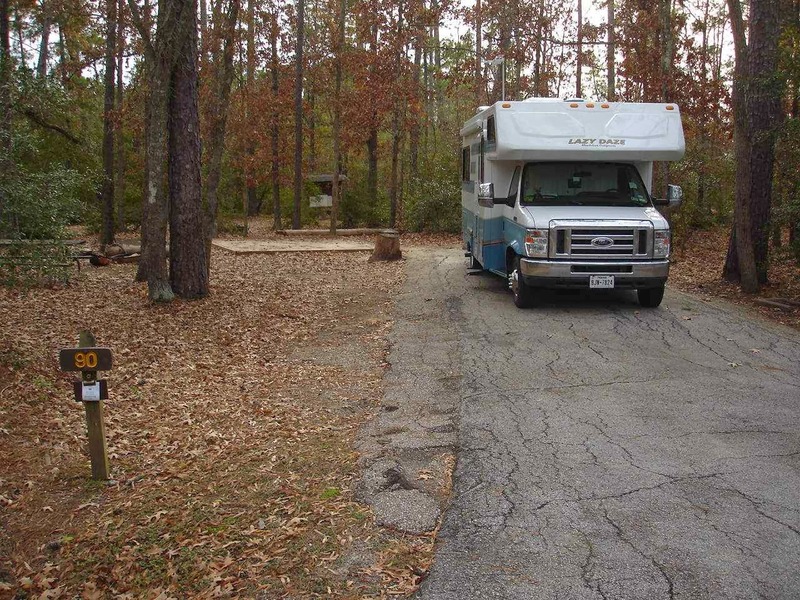 After a few nights at Cagle, a full hookup for $10 per night on Lake Conroe, we head north on Route 45 towards Huntsville for the long way back to Livingston. 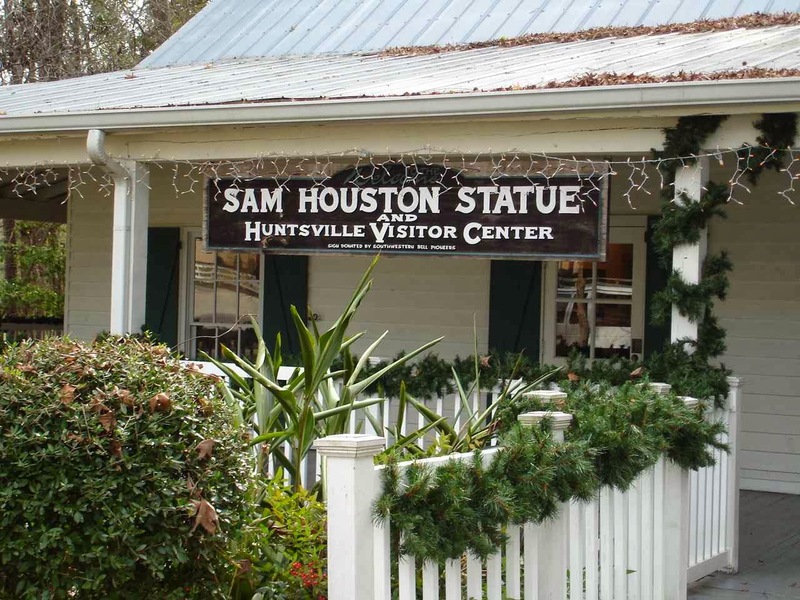 Huntsville is the home of Sam Houston. He was born in Virginia, was Representative from Tennessee, but is most known for being the first and third President of the Republic of Texas, and then U.S. Senator from the new state of Texas, and after that the Governor of Texas. Right beside Route 45 in Huntsville is this statue of Houston, finished in 1994. Do you see tiny Jan standing at his feet?? The gentleman in the visitor's center is a native of Huntsville. He first wanted us to be sure that Huntsville likes to be known for more than being the "execution capitol" of the United States. 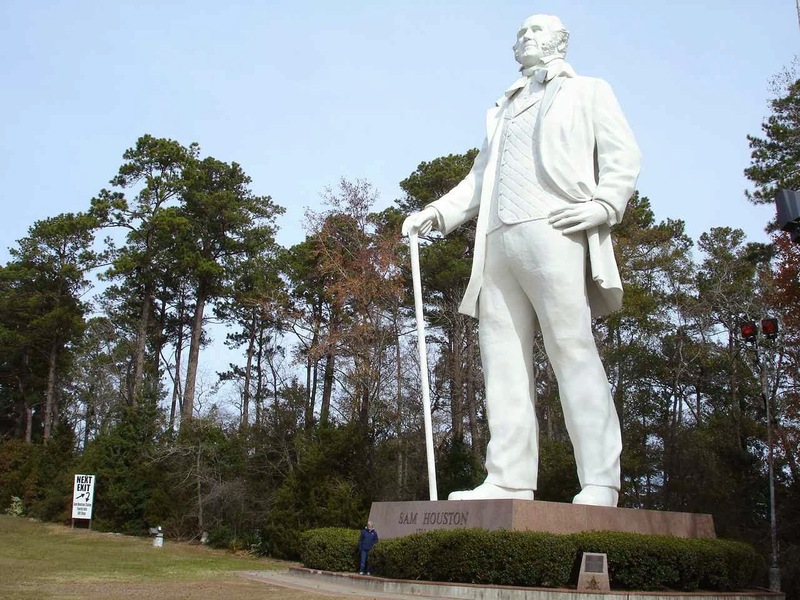 Besides Huntsville Prison they want to be known for the most famous resident, Sam Houston. Wait a minute. We are south--in Texas--where the weather is warm. That's almost colder than New England. Oh, well--only one night and then back to almost normal. Thank goodness your trips aren't that bad. That means you were taking good care of your teeth, which is actually important if you're living on the road. After all, you won't have access to a dentist all the time, so prevention is going to be key to avoid dental problems.